For those of you who want to delve into the Benefit skincare line, but don't want to fork out on something you may not like this is the thing for you! The Benefit b.right (great play on words there) radiant intro kit consists of 6 miniature sized products from their range. I think little sets like this are a brilliant way to try a bit of everything from a brand so you can see what's worth committing to and what's not, that's exactly why I decided to purchase this, I have heard so many good things about their skincare line I just couldn't decide what to get first (probably because I'm the most indecisive person in the world). You need to take a moment to appreciate the packaging?! you'll want these out on your dresser for sure! 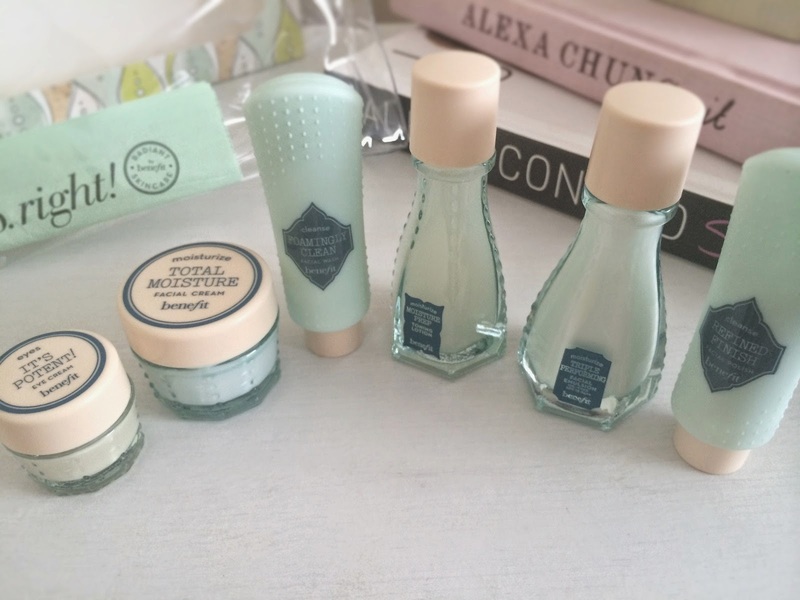 some of them look like little vintage bottles with a cork style lid, they are seriously perfect! is it me or do Benefit always seem to have their packaging down to a T where it just has to be out on display? First up for the review is.. I use this one in the mornings because this isn't the type of wash you would use to take your makeup off at night, its quite thick and creamy with a slight pearlescent sheen to it, I guess that's why it has such a brightening effect to the skin. After I have used this my skin feels squeaky clean and looks super radiant. It doesn't have an offensive scent to it, its quite mild, fresh, yet girly I personally really like it. This product's only down fall is the fact it really stings your eyes if you accidentally get any in there..it states on the little information booklet that's included to avoid the eye area, so if you get this please do so because it really flipping stings! After I have cleansed, this toning lotion gets swept over my face with a cotton pad, I think this one is absolutely brilliant and not like any other toner I've used, instead of leaving my skin feeling tight and slightly dried out like most toners can, this one is a lot more gentle and seems to add moisture back in while leaving your skin really refreshed, it also allows you to reap more benefits from your serums/moisturisers. This Moisturiser is beautiful, it delivers instant hydration which is perfect for those dry skin days its also a lot ticker than the other moisturiser in the b.right line so i tend to use this as my night time moisturiser; i can see this easily becoming a skin care staple in the colder months when my skin needs an extra helping hand. It sinks into the skin nicely and leaves it lovely glowy and smooth. around my delicate eye aerea which makes such a lovely change. I find this really brightens up the aerea too, could this be due to the peachy yellow colour of it? Would I buy this full size? - already in my shopping basket! This is a facial scrub/ exfoliator, its supposed to help minimise pores and brighten the skin. Well it certainly brightens but i cant comment on the pore minimising effects as of yet..i guess its something ill only notice on continued use. Would I buy this full size? - Maybe if I fancied switching up my skincare routine a bit. I use this one as my day moisturiser, as its lovely and light yet super hydrating, also the perfect kind of moisturiser for the warmer months. Its oil free, contains SPF 15, and magically helps to capture and maintain the water on the skins surface thanks to the special tri-radiance complex.. sounds snazzy eh?! This also makes a great base for my makeup in the morning as it leaves my skin looking all bright and fresh without any signs of greasiness. What do you think of try-me kits? 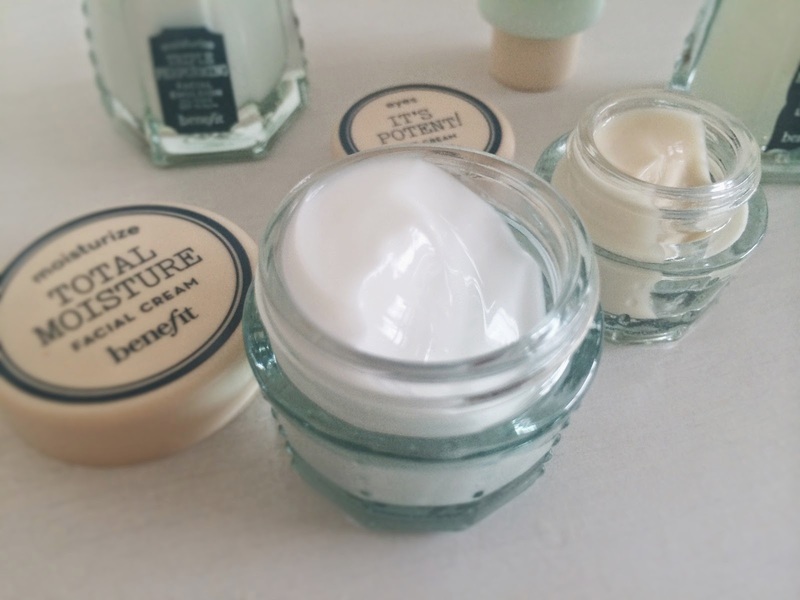 Have you have the Benefit skincare line a go? What are your thoughts? I've been wanting this for so long now! The kits actually really well priced for benefit. I love the eye cream, i use it most nights! I've been eyething this up on ASOS for ages now! From what you've said may just look into the eye cream!! Great review! Anything by Benefit is on my wishlist, but I like the idea of getting some smaller versions to try before I buy big versions so I don't end up with tons of stuff I wont use. I guess it's better for the environment that way too. I have only ever tried the benefit Total Moisture Facial Cream but I loved it. I'm keen to try the eye cream as well. Great review of their skincare line. I love reading about skincare for some reason! I've only tried the It's Potent eye cream, and I agree it is really good but it stings so much if you get it in your eye!